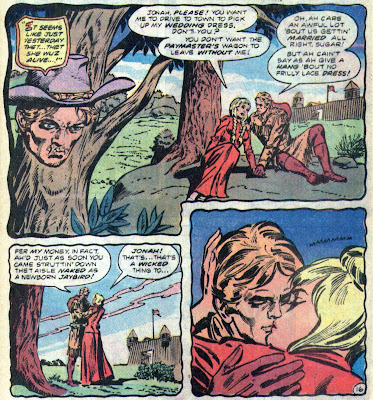 Matching Dragoons: Jonah Hex #65 "The Vendetta!" 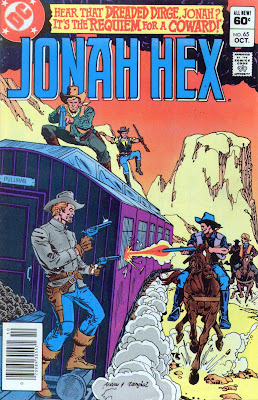 Jonah Hex #65 "The Vendetta!" First off, the cover states "Requiem for a Coward!" but the story is "The Vendetta!" They fix that in issue #66 by putting the wrong title on that cover as well. But to get started, Jonah Hex is riding a train and spending the time chatting with an elderly woman on her way to St. Louis. We see eight masked men on a hill over the tracks, armed with rifles. As the train passes by, the men leap onto the train. Two robbers burst into the car that Jonah is in and he rewards one of them with a nice shotgun blast to the neck! And just so the dead guy's buddy doesn't feel left out, Jonah gives him one to the chest. The other robbers, hearing the shotgun blasts, realizes that something has gone wrong, so after grabbing the mail bags, they hightail it. Jonah unloads his horse that was also on the train and realizing that he is losing daylight fast, decides to head into a nearby town and get some sleep before tracking the bandits. Meanwhile, in that aforementioned town called Clearwater Springs, Sheriff Barstow is commencing with the monthly shakedown of the local business owners. The sheriff charges $30 a month for 'protection' from bandits because the county doesn't pay him near enough. While Barstow is walking down the street, counting his cash, he notices a newcomer to town. It's Jonah Hex, older and all scarred up, but still Jonah Hex. Barstow panicks and starts to leave town, but then has a better idea. He decides to see if Jonah is just passing through and not looking to settle a score from 15 years ago. Barstow sends a telegram to Rod Webster to see if he can get some help. Out in the street, Jonah walk past two boys fighting. The shorter of the two is defending the honor of a small girl (the bigger kid called her a name) and of course, the shorter kid knows what time it is because he is getting his clock cleaned. Jonah steps in to break up the fight, just as the big kid's dad shows up. The guy is a huge moose that ends up taking a swing at Jonah. Jonah reciprocates and smacks the guy right into a horse trough. Barstow ends up running into the jail where is deputies are finishing the local shakedown. 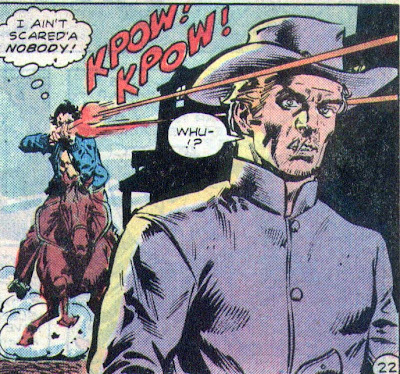 They ask why he looks scared and Barstow starts explaining about Jonah Hex. He produces a photograph of several men and a lovely woman. The woman is Cassie Wainwright, daughter of Col. Marcus Wainwright and Jonah was a scout for the army back in 1859. The deputies wonder why Jonah is their problem and Barstow says that their sweet shakedown racket will come to an end if they don't get rid of Hex. The next morning, Jonah has returned to tracking the train robbers and he finds them in some old Indian cliff dwellings. He locates a rope and manages to slide down to the dwellings without the rope breaking (even though he mentioned the terrible possibility). Jonah kills the two sentrys and is working his way through the buildings when overhears the robbers splitting up the loot, setting aside a share for Sheriff Walt Barstow, to pay for his protection. Jonah is amazed that it could possibly be the same man that he knows from years ago. He is not too amazed to bust in on the four remaining robbers, subdue them and that them into captivity. Jonah decides that he should take the robbers to a different town, just in case Barstow is who Jonah thinks he is. That night, Hex heads to Clearwater Springs and breaks into the jail, riffling through the sheriff's desk. He locates the photo and we are treated to a flashback to 1859. FLASHBACK: Jonah is an Army scout and is spending some time with his fiancee, Cassie Wainwright, daughter of the Colonel of the fort. Cassie is heading into town to pick up her wedding dress and will be riding with the men picking up the payroll for the fort. Barstow is heading up the men heading to Portersville, a nearby town. On the way into town, one of the other men is saying that Cassie is going to mess up the entire plan, but Barstow says that they have worked too hard for that to happen. In town, Cassie gets her dress and the men pick up the $100,000 payroll (1.8 million today, that's some well paid soldiering going on there). On the way back Cassie notices that they are not heading to the fort, but are heading into Comanche land (placing this fort in either current day Texas or Oklahoma). She demands that they head back to the fort and Barstow punches her in the mouth to shut her up. Cassie falls back, striking her head on the wagon, knocking herself out. One of the men see that there are Comanche scouts on the hills and they grab the contents of the strongbox and head out. They leave Cassie unconscious, despite some of the men commenting on the horrible things that Comanches do to white women. END OF FLASHBACK! Jonah is remembering how he vowed to find those men, but the war came along and 15 years later, he was finding it kinda hard to keep a grudge going. He steps out into the street and finds he is being called out by Sheriff Barstow and two deputies. Jonah tells the deputies that he has no truck with them and he sees no reason why they should die too. 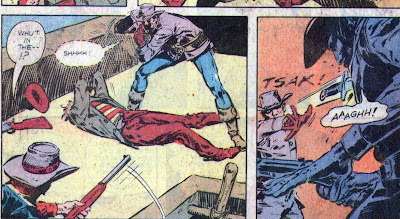 Barstow says that the three of them can kill Hex, but one of the deputies says that he has heard that Jonah Hex has killed six men at once and if Hex is offering him a chance to run away, he'll take it. Both deputies hightail it outta there in no time flat. Barstow, facing Jonah alone, starts bargaining. Saying that a person can't carry hate for 15 years, Barstow says that he'll get on a horse and Jonah will never see him again. Besides, Hex wouldn't shoot a man in the back. Barstow jumps on a horse and rides outta town, but when he hits the end of the street, he wheels his horse around and comes gunning for Jonah, even though Hex's back is turned. Jonah wheels, dropping to the ground and drops Barstow with two quick shots. 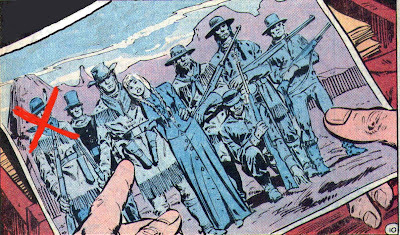 Standing over the sheriff's corpse, Jonah spots a copy of the telegram that was sent to Rod Webster. Jonah, looking to the sky, asks Cassie if he should hunt these men down after fifteen long years. Getting no answer, he decides to get a bottle and do some thinking. Timeline - Well, Cassie was left during the robbery back in 1859 and it is 15 years later. Therefore, this is in 1874. Seems pretty safe bet since there is no mention of Mei Ling. I really enjoyed this issue and this entire arc is one of the better ones in the 80's, right behind the China arc we just finished up. Barstow, calling his deputies cowards, turning tail & running, & finally shooting at Jonah's back was a complete exercise in cowardice itself. Hang on kids, this is gonna be a really bumpy ride. Update 05/24/09: Due to events that happen later in this arc, this storyline does happen after the China adventure. Since the last of the China adventure was November, 1876 and there is no sign of snow in this arc, I'll start by placing this issue in March of 1877. Next Issue: Rod Webster gets into twelve kinds of trouble and Jonah goes skinny-dipping. Yup, wet beefcake is on the menu. This does sound good. The money thing always drives me insane however. The average private soldier made about $13 a MONTH! Plus Cassie really ought to be wearing a crinoline. God, I'm such a pedant. Well, let's just say that it was the monthly payroll and the fort employed 7700 soldiers. Or if it was an annual payroll they would have had about 650 soldiers. The real kicker? On one page the payroll is cited at $100,000 and four panels later it is $300,000. How's THAT for inflation? Either inflation, or someone had a printing press in the basement. Oh, and you had me, at wet beefcake, by the way.